It's Negroni Week! Imbibe Magazine and Campari, maker of the classic Campari and Aperol aperitifs, created Negroni Week in 2013 to celebrate the Negroni--a favorite summer cocktail--as well as raise money for charity. There are 5,906 participating venus this year that will donate to charity with each Negroni sold (find a location here). For Negroni Week this year, I'm offering up one of my favorite Negroni variations, the White Negroni. 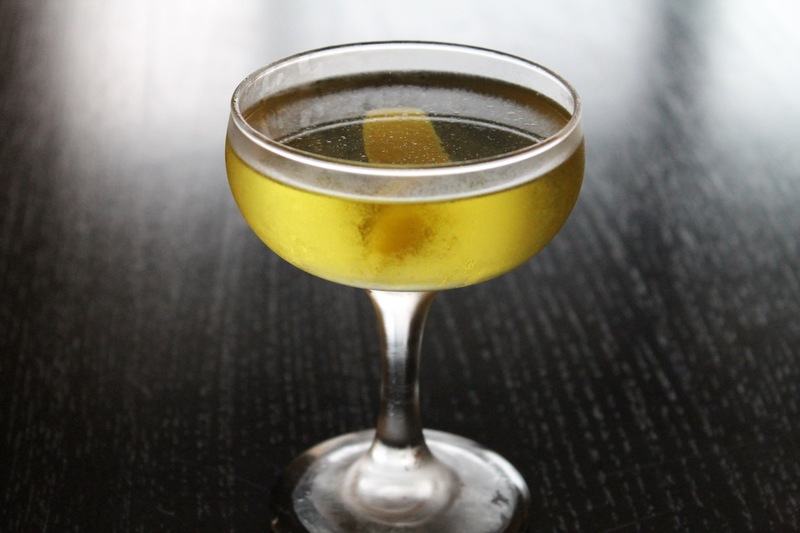 Like the original, it has a gin base, but it uses white vermouth, such as Dolin blanc or Lillet blanc, instead of sweet vermouth, and a bitter liqueur instead of Campari. This Negroni's bitter flavor comes not from Campari but from Suze, a bitter French liqueur flavored with Gentian root. Campari can come on a bit strong, so if you're not a big fan of it, you might like the White Negroni, as I find it to be a little sweeter and less bitter (another trick is to substitute Aperol, which is similar to Campari--and also made by the Campari company--but less bitter and more citrus-flavored). I've also seen the White Negroni made with Cocchi Americano, which I think would be interesting, probably less sweet and definitely would make for a truly "white" drink, since Suze has a yellow tint. You can play around with the ratios if you like. I've seen some with equal parts vermouth and Suze (3/4 oz. each), but I find this ratio that dials back the Suze a bit to be an ideal balance for my desired level of bitterness. There are many other interesting variations of Negroni out there. Mayahuel, the wonderful mezcal-focused bar in New York, has a clever variation on the White Negroni they call the Blank Slate, made with sotol (a wonderful Mexican spirit I plan to write more about very soon), Cocchi Americano and Suze. See the related links below for some of the ones I've featured on my site, as well as recipe for the classic Negroni. Combine gin, vermouth and Suze in a cocktail mixing glass with ice. Stir until well-chilled (about 30 seconds to 1 minute), then strain into a chilled cocktail glass. Garnish with a lemon twist. Negroni, the classic original with gin, Campari and sweet vermouth. Fail-Safe, a Negroni variation from Death & Co. with Aperol, sloe gin and dry curaçao. Teagroni, from Kevin Liu's Craft Cocktails at Home, this variation gets its bitterness from tea with honey for sweetness. Barrel-Aged Berlioni, a very interesting variation from Greg Henry's Savory Cocktails, adapted from Gonçalo de Sousa Monteiro's recipe for the Victoria Bar in Berlin, which uses barrel-aged gin, Cynar, white vermouth and orange bitters.